A pooch pilot with more than 250 flying hours has become the only dog in the UK to have her own crew card. 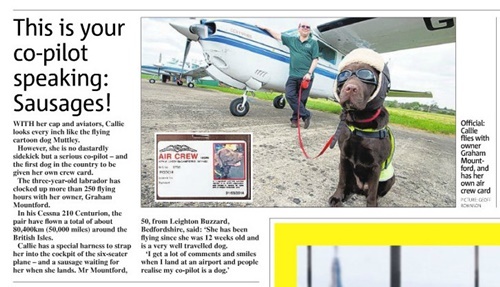 Canine captain Callie, a chocolate Labrador, has flown a massive 50,000 miles around the country with owner Graham Mountford in his Cessna 210 Centurion. A little girl has become a MODEL for a top fashion label - despite the fact she cannot WALK or TALK. 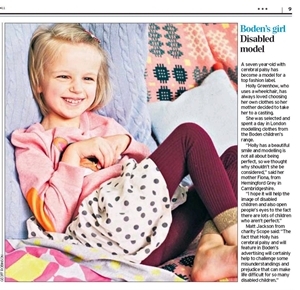 Seven-year-old Holly Greenhow has athetoid cerebral palsy and is in a wheelchair but she has not let her disabilities hold her back and features in the latest modelling shoot for Boden. 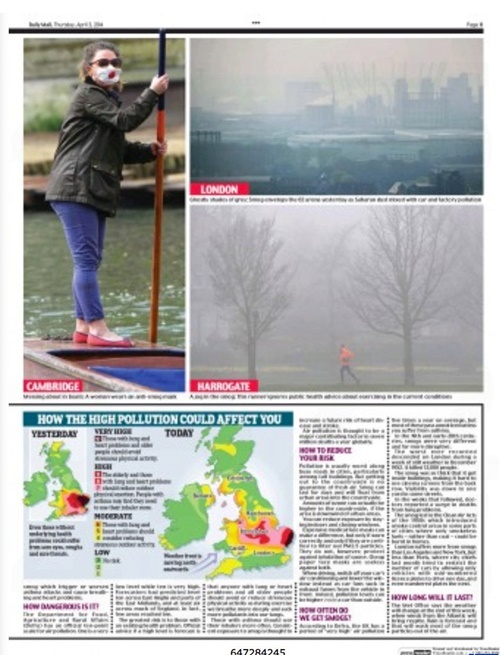 Holly, whose condition was caused by a prolonged loss of oxygen at birth, was chosen after attending a casting earlier this year, where she shone in front of the camera. Most people park a CAR on their driveway so residents were stunned to see a rare WW1 TANK in front of their neighbour’s house. 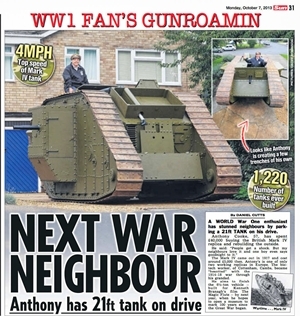 Military enthusiast Anthony Cooke, 57, has been keeping the huge 21ft long army tank on his driveway on a residential estate while he refurbishes it in time for next year’s centenary of the start of the Great War. The massive vehicle, which is 13ft wide and weighs 6 ½ tonnes, is one of just two working replica Mark IV tanks in Europe. The original sketches and artwork for Ladybird Books’ FIRST title, "Bunnikin’s Picnic Party", has gone on public display for the first time 74 YEARS after it was published. 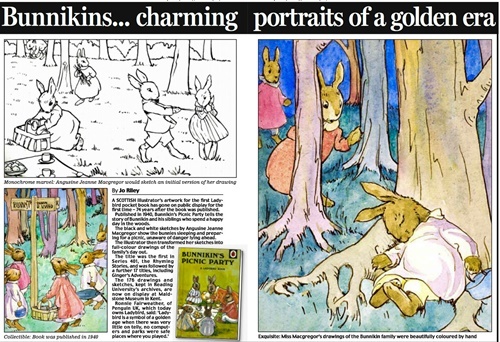 The beautiful pictures of Mrs Bunnikin and her family by Scottish illustrator Angusine Jeanne MacGregor have gone on show more than SEVEN DECADES after they were drawn. 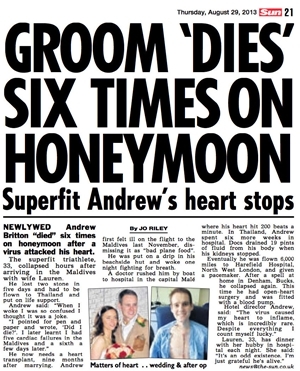 A super fit man who does triathlons has miraculously survived after contracting a heart-attacking virus on his HONEYMOON and dying SIX TIMES. 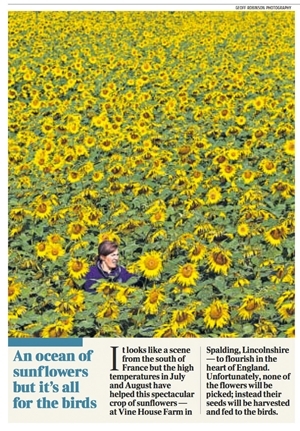 Andrew Britton is now waiting for a heart transplant after spending nine months in three different hospitals and suffering cardiac failure six times. The 33-year-old, who enjoys running and playing squash, collapsed hours after arriving in the Maldives for his honeymoon. Just five days after his dream wedding to wife Lauren he had lost two stone and had been transferred to a larger hospital in Bangkok, Thailand, where he was put on a life support machine. 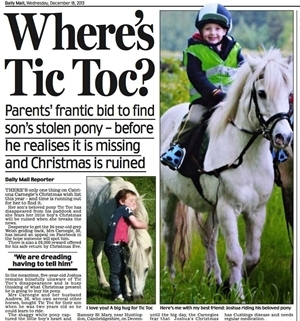 A mum has launched an emotional nationwide appeal to SAVE her five-year-old son’s CHRISTMAS after his beloved pony Tic Toc was stolen from their paddock. Catriona Carnegie and her husband Andrew, 36, have not yet told their little son Joshua the heart-breaking news that his “best friend” Tic Toc is missing. Instead they are desperately hoping the 24-year-old welsh grey gelding will be returned in time for Christmas Eve and are doing everything they can to find him. A man had a narrow escape after a car ploughed into the kitchen at 30mph and shunted the oven across the room – minutes after he had cooked some sausages. 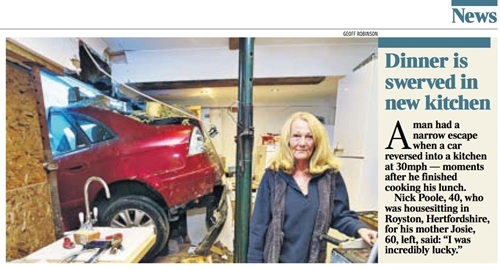 Nick Poole, 40, had taken just two bites out of his sausage sandwich when he heard a huge bang and rushed back into the kitchen to find a Citroen C5 had reversed into the house. 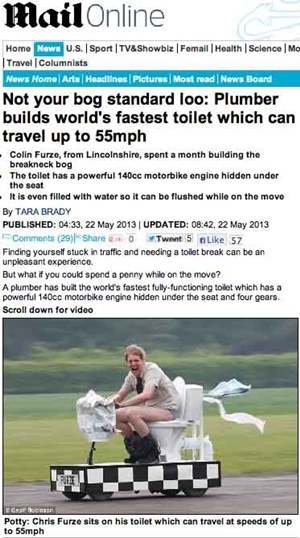 A plumber has built the world’s FASTEST fully-functioning TOILET – which whizzes along and even FLUSHES as an incredible 55mph. 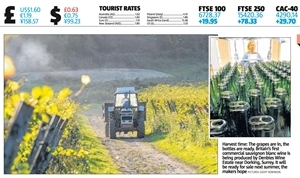 Colin Furze, 33, has spent a month building the breakneck bog, which has a powerful 140cc motorbike engine hidden under the seat and four gears. 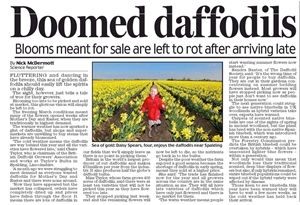 One of the OLDEST cricket clubs in the WORLD has been forced to cancel their season after the entire pitch was dug up and destroyed by BADGERS. 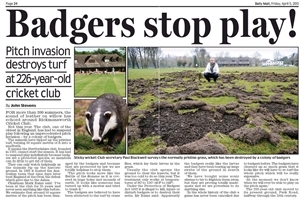 Rickmansworth Cricket Club, which has been in existence since 1787, was due to start its season on April 20 but a colony of badgers has left huge holes in 50 square metres of the manicured turf. An extremely rare picture of a team of WOMEN code-breakers who operated Colossus – the world’s first electronic computer - has been uncovered on its 70th anniversary. 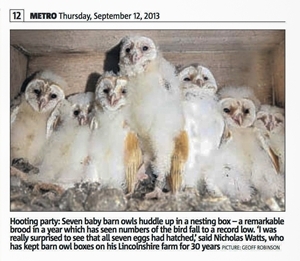 The photo, which has never been seen before, has been kept hidden in a bureau by veteran Joanna Chorley for seven decades. 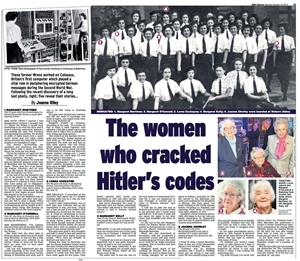 The 88-year-old was part of the Colossus C watch at Bletchley Park in Buckinghamshire during the Second World War and one of the world’s first computer operators. 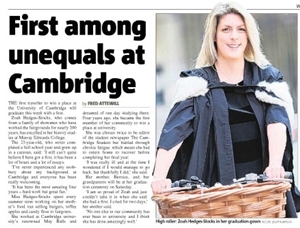 A woman who is a criminal LAWYER by day is leading a secret double life as a POP STAR by night. Bowie Jane works full time as a straight-laced barrister during the day, but unbeknown to her colleagues and clients she moonlights as a pop siren - often performing in front of thousands.